It’s a cloudless, sun-drenched evening in June as Alison and Jeff Senior, together with their three-year-old, Kira, arrive for Kira’s junior kindergarten orientation at Cedar Creek Public School in Ayr, Ont. The classroom is festooned with finger paintings, paper cut-outs of flowers and butterflies, and a quilted wall hanging of Winnie-the-Pooh. Scattered about are children’s toys, whose clanking, jingling sounds interweave with exuberant cries. Kira is round-faced and pigtailed, dressed head to toe in pink and blue. With a wide-eyed grin, she unhesitatingly approaches parents and “future Coyotes,” stretching out her arms and uttering words of greeting. In many ways, Kira and other people with Down syndrome have far better prospects today than at any other point in history. The life expectancy of a baby born with the condition has increased fivefold since the early 20th century, thanks to medical advances and better social supports. So it’s something of a paradox that the number of Down syndrome births could soon start falling as a new generation of prenatal tests makes it easier to identify potential genetic anomalies. Far safer than the traditional invasive procedures that carry a slight risk of miscarriage, the new tests will allow more women to make decisions about their pregnancies as early as the first trimester. The potential popularity of this new testing raises important questions, however. Disability advocates fear that the technology will make it easier to screen out Down syndrome altogether. And they wonder what a future without any more Down syndrome births might look like. Will existing supports for individuals currently living with the condition wane? Will additional genetic tests follow, leading to the termination of fetuses showing signs of other disabilities? And what are the ethical implications of becoming a medically idealized society? Down syndrome was first described as a condition by English physician John Langdon Down in 1866. It’s characterized by extra copies of chromosome 21 — three instead of two. Approximately one in 750 live births — or 500 babies a year — are affected in Canada, according to the Public Health Agency of Canada. People with Down syndrome have intellectual disabilities, usually mild but sometimes severe, and many children born with the condition experience thyroid, hearing or vision problems. They’re also at an increased risk for medical conditions such as heart disease, Alzheimer’s and leukemia. Today, a baby born with Down syndrome can be expected to live to nearly 60. Diagnosable prenatally since the late 1960s, Down syndrome has traditionally been detected with invasive procedures such as amniocentesis, which requires a sample of amniotic fluid to be taken from the uterus. The test carries a small risk of miscarriage. But a simple, cell-free test now looks at traces of fetal DNA in a mother’s bloodstream. First introduced in 2011, non-invasive prenatal testing (NIPT) is relatively pain-free and can be performed even earlier in a pregnancy than amniocentesis. NIPT represents a significant innovation in prenatal testing, according to Vardit Ravitsky, an associate professor of bioethics at the University of Montreal. She’s one of about 30 researchers taking part in the PEGASUS project, which examines new screenings for conditions such as Down syndrome. The multimillion-dollar project has found that NIPT is highly accurate, with an almost 99 percent detection rate for Down syndrome. Today, a handful of American companies offer the test to Canadians at an average cost of $500. When it was first introduced in the country, NIPT was only available as an out-of-pocket service. More recently, though, Ontario, British Columbia and the Yukon have begun funding NIPT for pregnant patients deemed a high risk for fetal chromosome conditions. They recommend that positive results from NIPT be confirmed through traditional procedures such as amniocentesis before any decisions about pregnancies are made. Last year, headlines around the world announced that Iceland was on the verge of becoming the first country where no Down syndrome births occur. While screening tests are optional, up to 85 percent of pregnant women take them, and just as many who receive a positive result decide to terminate their pregnancy. “We have basically eradicated, almost, Down syndrome from our society,” geneticist Kári Stefánsson told CBS News in August 2017. Of course, Iceland has a population of only 350,000. Between 4,000 and 5,000 babies are born there every year — only two or three with Down syndrome. By comparison, about 6,000 American children are born with the condition annually, and an estimated 67 percent of American women choose to have an abortion if their fetus is diagnosed with Down syndrome. Termination rates in much of Europe are similar to Iceland’s, while Canada lacks reliable data. The possibility of eradicating Down syndrome worries Chris Kaposy, an associate professor of bioethics at Memorial University in St. John’s, N.L., and the author of the new book Choosing Down Syndrome: Ethics and New Prenatal Testing Technologies. Our society tends to view developmental disabilities as a medical problem, he says, but that misses the larger picture. In the early days of Alison Senior’s pregnancy, she and her husband initially opted out of any prenatal testing. But Alison’s 11-week ultrasound showed soft markers for Down syndrome, and they agreed to the NIPT that was newly available in Ontario. They figured that a positive diagnosis would help them to better prepare themselves. The results came back “99 percent for Down syndrome,” Alison remembers. A genetic counsellor then recommended the more traditional amniotic fluid test, and it, too, came back positive. Alison experienced what Jeff describes as a grieving process: “You have this idea that your child is going to be a certain way. And now you have this reality that maybe that’s not going to be the case.” As a special education teacher, Alison also felt guilty for harbouring doubts about the future, knowing fully what a “child with an exceptionality” looks like in the classroom. She was happy to instruct such students, she says. So why was it okay for other people to have a kid with Down syndrome, but not okay for her to do the same? While the Seniors are pro-choice, ending the pregnancy was never an option for them. “It just never dawned on us,” says Jeff, who is an elementary school principal. 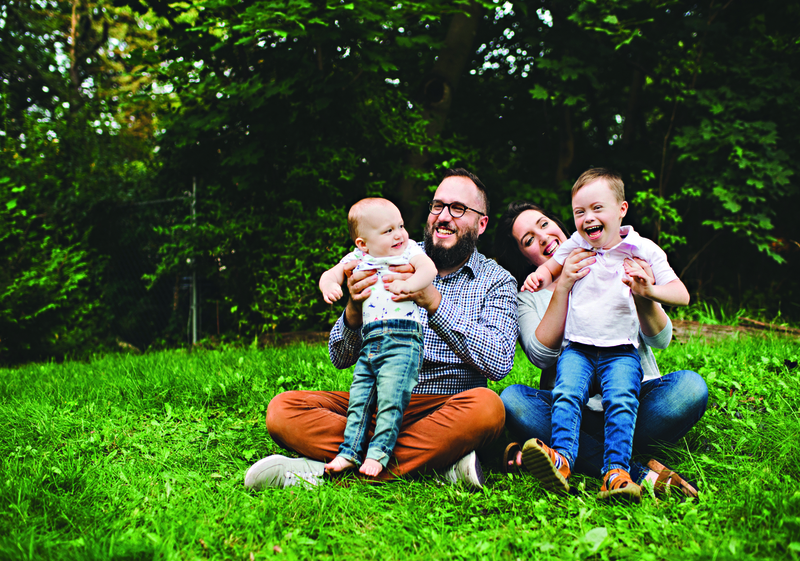 Ultimately, they accepted the diagnosis and began to prepare for the birth, with Alison undergoing more ultrasounds and meeting with maternal fetal medicine specialists at Hamilton’s McMaster hospital. A 2007 Dutch study explored the motivations of women who chose to terminate their pregnancies after a prenatal diagnosis of Down syndrome. Researchers found that more than 60 percent of respondents considered the burden of having a child with Down syndrome too heavy for themselves and their families. More than 80 percent believed that the child would never be able to function independently, and they wondered about care arrangements after their own death. Only 11% indicated that their child put a strain on their marriage, and just four percent experienced regret about having a child with Down syndrome. In 2014, notable atheist Richard Dawkins went as far as saying that it would be “immoral” to knowingly carry on with a Down syndrome pregnancy. “Abort it and try again,” he tweeted, in response to another social media user who had commented that it would be “a real ethical dilemma” if she learned that her baby would be born with the condition. It was just over a decade ago when then-minister of foreign affairs Peter MacKay announced that Canada would sign the United Nations Convention on the Rights of People with Disabilities (CRPD). The Canadian disability community was on hand for the March 2007 signing ceremony. It had worked for five years to see the CRPD come to fruition. Bach says that people believe the “broad rhetoric of inclusion.” But the numbers don’t always bear this out. Only 40 percent of students with developmental disabilities are fully integrated into regular classrooms, he says. People with developmental and cognitive disabilities are also three to four times more likely to die preventable deaths and four times more likely to be victims of violence, according to Bach. Nearly all people with Down syndrome are content with their lives, according to Harvard medical geneticist Brian Skotko, who co-directs the Down Syndrome Program at Massachusetts General Hospital. Skotko’s team surveyed people with Down syndrome, as well as their parents and siblings, in 2011. The findings are clear: 99 percent of people with Down syndrome reported that they were happy with their lives and loved their families, while 99 percent of their parents said that they loved their child, and 97 percent felt proud of them. Only 11 percent indicated that their child put a strain on their marriage, and just four percent experienced regret about having a child with Down syndrome. Siblings of people with Down syndrome similarly reported near-unanimous love and pride for their brother or sister with the condition. 99% of people with Down syndrome reported they we’re happy with their lives and loved their families. South of the border, Down syndrome has emerged in recent years as a new front in America’s abortion wars. Pro-life lawmakers in North Dakota, Louisiana, Indiana and Ohio have moved to prohibit abortion in cases of Down syndrome, and similar bills are currently being floated in several other states. Critics say the laws unfairly restrict a woman’s right to choose. Indeed, a federal appeals court struck down the Indiana legislation as unconstitutional, and a district judge blocked the Ohio law last March before it could take effect. Inside the Seniors’ house, a wooden sign reads, “Bless our home with love and laughter.” After cavorting with her soon-to-be classmates earlier in the evening, Kira sits comfortably on the living room sofa, eating grapes and watching Beauty and the Beast on her tablet for the umpteenth time. All at once, she stands up and clambers sideways on the cushions. She loses her balance a moment later, careening forward against the arm of the sofa and erupting into giggles. Alison admires her daughter’s high spirits. “She is so full of life,” Alison says. “She’s a ‘Here I am’ type of girl. ‘This is what you got.’ And it’s all good.” To help with Kira’s developmental disability, Alison and Jeff regularly take her to see a music therapist, two occupational therapists and two speech therapists, the costs of which are only partly covered by provincial and workplace benefits. Although she understands spoken language, Kira struggles to articulate some h’s and g’s. Kevin Spurgaitis has been employed in the Canadian and overseas media for nearly two decades and has written in-depth feature articles and web-exclusive content for consumer and trade publications. This article of his was Reprinted with permission from The United Church Observer from its September 2018 issue.